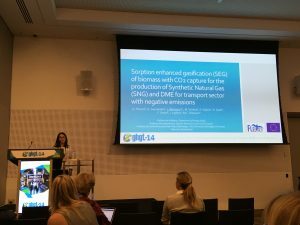 The analysis of “Sorption enhanced gasification (SEG) of biomass with CO2 capture for the production of Synthetic Natural Gas (SNG) and DME for transport sector with negative emissions” has been presented during the 14th International Conference on GreenHouse Gas Control Technologies (GHGT-14) held in Melbourne in October, 21st-26th. The full presentation is available in the download section. This work is a collaboration work between POLIMI, USTUTT, ICB-CSIC and QUANTIS. The basic performance results obtained for the balances of two synthetic fuel production plants are assessed: the SEG-SEDMES plant studied in FLEDGED and CH4 production for comparison. Mass and energy balances have been solved and their performance has been compared. The calculated biomass-to-fuel equivalent cold gas efficiency CGEeq (i.e. accounting for energy credits/debits associated to electricity export/import) ranges from 53.8% of the bio-SNG plant to 51.3% of the bio-DME plant. The WTW greenhouse gases emission saving of a bio-DME vehicle in comparison with a conventional diesel vehicle is around 100 g CO2-eq/km. The assessed plants are also able to capture 63-67% of the inlet biomass carbon, equivalent to 155 g CO2-eq/km removed from the atmosphere and stored.